There are countless reasons to visit Merridale Cidery. I’ve listed 9 of them here, all of which place it near the top if my list of local Cowichan Valley tours. Merridale does not disappoint with its gorgeous orchard. Merridale is located in Cobble Hill, BC, one of the area’s main farming regions. It’s well worth taking a walk around the orchard and taking the fun and interactive self-guided tour to get a good thirst going before you hit their tasting room to sample their refreshingly delicious products. Be sure to ask any questions that may arise when you hit up the cider bar for a tasting. 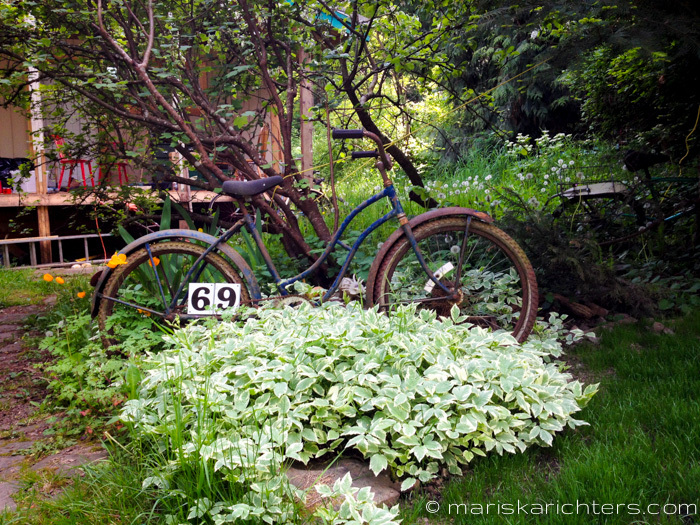 Besides the resident bee hives, birds and other creatures, the orchard is home to a community of faeries! Bring your children along on your orchard adventure (they tend to come out when you sing as you walk) and when you get to the cider bar, they can sample Merridale’s apple juice and collect an Orchard Adventure Stamp. The Brandy House is one of the few artisan distilleries in the province and offers tours, and tastings of their spirits, fortified line, and fruit based vodka. The Brandy House is also an excellent venue for stand-up receptions and is a unique venue to host company or group gatherings. Merridale will be adding their first whiskey product to their already impressive product line later this year. Stay tuned here and to the Merridale website for updates. I try to plan my stop at Merridale so that I can enjoy lunch or a snack in the bistro. The food is inspired by traditional cider regions in Europe using local seasonal ingredients and fresh cut herbs. The bakery features an amazing outdoor brick oven. Every Sunday throughout the summer, Merridale hosts their famous pizza nights on their covered deck. Each week they feature several unique artisan pizzas straight from their brick oven featuring housemade charcuterie and local seasonal produce. Pair that with a fresh glass of cider and local musicians and you’ve got yourself a fun evening out to get your upcoming week started off just right. For a list of musical artists, visit Merridale’s events page. Sip cider and nibble on charcuterie while you get pampered in the Merridale Orchard Spa! The spa is located in the Merridale yurts which include with a relaxation patio overlooking the pond. “What IS a yurt?” you may ask. A yurt is a portable, round dwelling used by the nomadic groups of Central Asia. Yurts have been around for at least three thousand years, and are known for their spiritual and calming benefits. The yurts are also available for romantic getaways from April to October. For rates and more information or to make a reservation contact Merridale staff. Merridale Cidery is a magical venue for a wedding! Get ready with your wedding party in the yurts or the outdoor bridal suite. Then walk down the manicured lawn and exchange vows in the pond-side gazebo. Celebrate and feast with your guests with gourmet food and drink in the Ciderhouse with a panoramic view of the orchard below. Not only does Merridale grow their fruit locally, but they also support other local farms and artists in the Cider Shop. You’ll find products from local cheeses and sausage to blown glass, paintings and cider-scented soaps. It’s definitely worth checking out to support the local community. Merridale makes a variety of beverages from ciders to ports to spirits, listed below. Tastings cost $5 (including tax) and all proceeds are donated back into the community to their charity of the month. Monarch Cider – It’s dry, bubbly, and created from a balanced blend of full bodied cider apples. Traditional Cider – It’s light, dry and effervescent. It appeals to true cider connoisseurs, and has been called “the best English-style cider in Canada” by wine expert Jurgen Gothe. House Cider – A lighter, sweeter version of our traditional cider, but still very dry. Scrumpy Cider – Scrumpy is strong and sharp, and rich in the flavours of our strongest cider apples. Cyser Cider – A traditional blend of pure vintage apple juice and wildflower honey, combined in a slow fermentation process that dates back to the Viking days. Merri Berri Cider – A refreshing blend of apple cider and the unfermented juices of a blend of BC berries and fruits. Somerset Cider – Dry and sparkling with balanced acids. Somerset is slowly aged for more than a year to become completely dry and is bottled Champagne style so it’s perfect to celebrate a special occasion. Winter Apple – A fresh and velvety sipping drink with an aroma of baked apples and buttery brown sugar. Pomme Oh! – A delicate balance of apple and brandy with a soft, slightly sweet finish. This is wonderful with soft cheeses. Mure Oh! – Has a strong blackberry odour and taste with a bitter sweet finish. Great for dessert or with apple pie. Stair’s Pear Brandy – Exhibits a clean fresh pear nose enhanced by the oak with subtle fresh aromas of pineapple and lemon zest finishing with strawberries and marzipan. Cowichan Cider Brandy – Made from six different blends of cider apples which we then placed in French Oak Barrels. When tasting the brandy, it is best served in a ‘snifter’ at room temperature. Swirl it in the glass and enjoy the aroma. Frizz Vodka – This is not fruit infused vodka, but vodka made from fruit. It is a secret blend of spirits made from cherries, plums, apples, and some pear. To make it a little more fun and distinctive, they’ve carbonated it! Blackberry Oh de Vie – Unfermented blackberry juice is added to rough brandy for the final distillation. This brandy has hints of anise along with the blackberry notes. Apple Oh de Vie – Has a distinct apple and cider aroma with a slight floral undertone of spring apple blossoms. It is wonderful as a digestif or in your favourite martini. So what are you waiting for? Merridale Cidery is a fun afternoon outing for the whole family! Wander the orchard, search for faeries, learn about the cider making and distillery processes and then tickle your tastebuds with a bite and a tasting. Have you visited Merridale Cidery? What was your favourite Merridale product? Follow Merridale on Facebook and Twitter. One of the things I’m loving about living on Vancouver Island is that the local community makes a great effort to shop local and support the small businesses within the community. One of my favourite parts of this is the local farmer’s markets. I love my weekly fruit and veggie stock up at Russell Farms Market, the farmer’s market closest to my house. I bought this huge bounty at Russell Farms Market for only $30! All the fresh local produce is picked each morning and can be on my plate the same day! It doesn’t get any fresher than that! If I was to buy all of this at Save On or Thrifty Foods I would probably pay close to $50. And the best part is that I’m not only saving money, but I’m eating healthy and supporting the local economy! For more information about Russell Farms, including weekly specials, visit their website, or better yet stop by for a visit and an ice cream cone! Do you shop local? Where is your local farmer’s market? I like to be organized when I travel to ensure I have a stress-free experience. Thankfully, there are some great travel apps for iPhone to help with this from planning a trip, to being on the ground at the destination, to connectivity with friends and family back home. SkyScanner – SkyScanner aggregates fares from airlines and the big travel sites to find you the best deal. For the budget traveler, there’s also an option to pin your search to your start screen and keep an eye on price fluctuations. XE Currency – Use this free app for all your currency exchange needs while you’re on the road. XE Currency allows you to track multiple currencies at once and uses live currency rates so it’s always accurate. Dropbox – I use Dropbox to save all my flight, hotel and insurance information as well as any other travel related documents that I may need to access while on the road. I find this much more convenient and secure than carrying all that paper around with me. I also have my iPhone set up to back up my photos to Dropbox as soon as I connect to wi-fi. This allows for easy organizing, filtering and sharing photos from my laptop later. Google Maps – This is one of the most used apps on my iPhone both at home and when I travel to know where I am and where I’m going. If I know I won’t have wi-fi or mobile reception where I’m going, I simply take a screen shot of the map before I head out, just in case. Trip Advisor – Use Trip Advisor to check out brutally honest reviews from real people for accommodations, restaurants, activities and attractions. I’ve found this to be extremely useful in finding places that suit my wants and needs, and for avoiding places that are less than adequate. I also leave my own reviews on TripAdvisor from time to time, view my profile here. A secondary Trip Advisor app is the Offline City Guide, which pairs suggestions for where to visit, shop, and eat at your destination. Avoid the stress of finding a wi-fi connection by downloading offline maps for your destination. Google Translate – This app was my saviour when traveling in Russia where I didn’t speak the language, nor could I read the alphabet. Simply type in what you want to say and the app will translate it to your language of choice both in text and sound through your iPhone’s speaker. Kindle – Don’t weigh down your luggage with books! Download your reading list for Kindle and read them on the iPhone or iPad. YouTube Capture – If you like instant upload gratification, use the YouTube Capture to get your travel videos uploaded to YouTube right away. You can record your video directly through the app, or upload videos from your library, edit, add music, a title and video description and then hit upload. Quick and easy! –> Subscribe to my YouTube channel! Instagram – If you’re like me, you take a ton of photos when you travel. Use Instagram to share your favourite photos with family, friends and followers. Customize your images using custom filter effects to create beautiful shareable photos. Instagram allows you to share your photos publicly, privately or send your pics directly to a specific user. –> Follow me on Instagram! WhatsApp Messenger – This cross-platform messaging app allows you to send messages, photos and video to your friends and family across the globe using wi-fi or your phones data package without any additional international texting charges. What are some of your favourite travel apps? Please share below. I ran into this Vancouver Island garter snake yesterday while watering the garden and managed to get quite close to take this video. He was actually quite curious and came to check out my iPhone while I took the video before slithering away. Most garter snakes have a pattern of yellow stripes on a brown or green background and their average length is about 55 cm, with a maximum length of about 137 cm. Garter snakes are very thin snakes. Most have longitudinal stripes in many different colours. They come in a wide range of colours including: green, blue, yellow, gold, red, orange, brown, and black. In summer, they are most active in the morning and late afternoon; in cooler seasons or climates, they restrict their activity to the warm afternoons. Have you ever been up close and personal with a snake? Please share your story in the comments below. Olympic Spirit Project Postcards Are Here! I’m so excited to announce that the Olympic Spirit Project postcards are now available in the online store! YAY!!! Why Are Olympic Spirit Project Postcards Awesome? They are an original tangible souvenir from the Sochi 2014 Olympic Games, not a commercialized or virtual product that everyone else has. People LOVE getting personalized mail! All most of us get these days is bills. Send an Olympic Spirit Project postcard to let someone know you’re thinking about them while supporting this inspiring ongoing project! Proceeds from postcard sales will go toward continuing the Olympic Spirit Project in Rio, Brazil in 2016 and beyond! The 5-pack of postcards is available for only $17.95 while they last. If you’re interested in purchasing individual cards or multiple copies of a single card, please contact me for pricing. Quantity discounts available. The Olympic Spirit Project book is very close to being completed and sent off for publishing! I can’t wait to see the images in print and to share the final book and eBook with you! Stay tuned for updates! Oh, and if your wondering where I get the cards printed, it’s through the super awesome MOO SHOP. <— Click this link for 10% off your very own MOO order! Please Share the Olympic Spirit With a Tweet! Last week I drove up to Cumberland, BC for the first time and I heard about the remarkable initiative of the Cumberland Community Forest Society. The Cumberland Community Forest Society is a group of residents from the Cumberland community dedicated to preserving the forest around Cumberland from Comox Lake to Trent River. The forest in this area has many heritage landmarks and is rich with plants and wildlife and is well worth protecting. Since 2000, the Cumberland Community Forest Society has successfully raised over $1.2M and purchased more than 70 hectares of land. The Society has a mandate to raise another $1.2M by 2016 to purchase three more parcels of lush second growth forest to add 50 additional hectares to the protected area, which is scheduled to be logged in 2016. Orange: Proposed forest purchases. Light Green: Existing community forest. Dark Green: Coal Creek Heritage Park. The Society has supporters from all over the world, from international tourists to local mountain bikers who have enjoyed their time on the local trails to local Community Partners and major corporate Guardians like Mountain Equipment Co-op. For a full list of supporters, click here. There are several options on ways to contribute from one-time donations to monthly contributions as low at $10 per month. I invite you to consider making a donation to help preserve this gorgeous piece of British Columbia and Vancouver Island. Monthly contributions to the Cumberland Community Forest Society can be made by cheque or credit card. One time donations are also accepted by cheque or credit card. Having grown up on Vancouver Island, our natural forests are close to my heart. I commend the Vancouver Island community of Cumberland for taking the initiative to protect our beautiful forests. I look forward to exploring more of the area in the summer months and can’t wait to share that experience here. Please consider making a donation to save the forest and the next time you’re on Vancouver Island, I encourage you to visit the beautiful Cumberland area so you can see for yourself that it’s worth preserving. For more information and to make your donation to preserve the forest, please visit the Cumberland Community Forest Society website, and follow them on Twitter and Facebook for updates. Have you visited the Cumberland forests? Please share your experience in the comments. One of Vancouver Island’s truly unique beach experiences is Botanical Beach, near Port Renfrew in Juan de Fuca Provincial Park. Botanical Beach is about a three-hour drive from either Victoria (via Sooke) or Nanaimo (via Lake Cowichan), so make sure you head out early to give yourself plenty of time to explore and enjoy the beach. It is a day-use area only, camping is not permitted on this beach. The best time to visit is at low tide, so you can walk out across the flat sandstone and granite beach to view tide pools filled with brightly coloured marine life. Botanical Beach is one of the richest tidal areas on the Island’s west coast. You’ll find that the tidal pools are full of life, including mussels, snails, sea urchins, anemones, crabs, little fish, kelp and more. It’s a natural aquarium that will keep you busy for hours. There are also opportunities to view larger marine life. I’ve seen a pod of grey whales and orcas breaching off Botanical Beach on two separate occasions. Whales have feeding grounds just off Juan de Fuca Park. The best time to see Grey whales is during their migration from the Mexico to Alaska in March and April. Harbour seals and sea lions are also commonly found playing offshore from August to May. Keep your eyes peeled on the open water and you could get lucky. Look in the tide pools only – do not touch the marine life. Do not remove, collect or disturb any tide pool life, shells, plants, flowers, kelp, etc. Even touching the water in a tide pool with sunscreen on your hands can create an “oil slick” that could kill the vulnerable creatures in this sensitive ecosystem. Watch your step while exploring. The rocks can be very slippery and can be dangerously sharp. Bring your camera. Photos make great souvenirs. Wear sunscreen to protect yourself from the sun and bring a hat for additional protection. Be sure to remove any valuables from your vehicle. Thieves are active in the area and it’s not uncommon to get back to your car to find that you’ve had an unwanted intrusion. Watch for wildlife. Juan de Fuca Provincial Park is a wilderness area and there are black bears and cougars in the area. Be aware of your surroundings and if you happen to come across local wildlife, do not feed or approach it. Wildlife gets dangerous if they feel cornered or have young. Steer clear, even if it means you need to leave the beach for your own safety. Bring binoculars in case you’re lucky enough to see whales playing off shore. Pack a picnic. 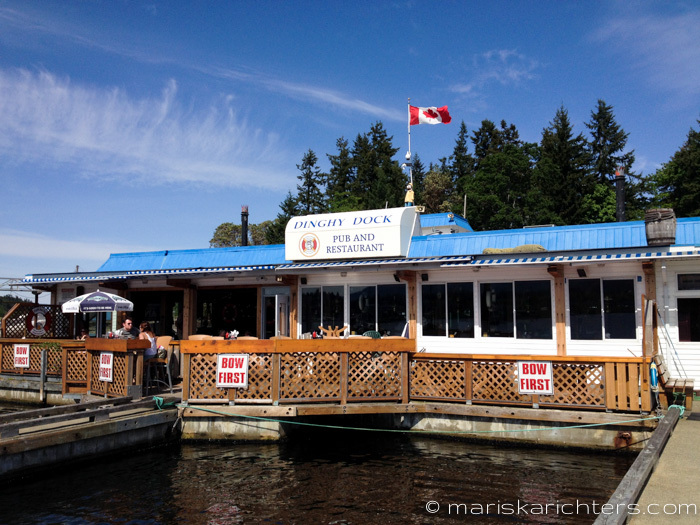 There are a couple of diner/cafe options in Port Renfrew, but there is nothing right on or near the beach. Pack a lunch with you if you plan to make it a full day trip. Pack it in, pack it out. If you bring a picnic or a snack to the beach, make sure you pack out all your garbage and dispose of it responsibly. No one likes a litterbug, please keep our parks and beaches clean. Stay for sunset. It’s absolutely beautiful! 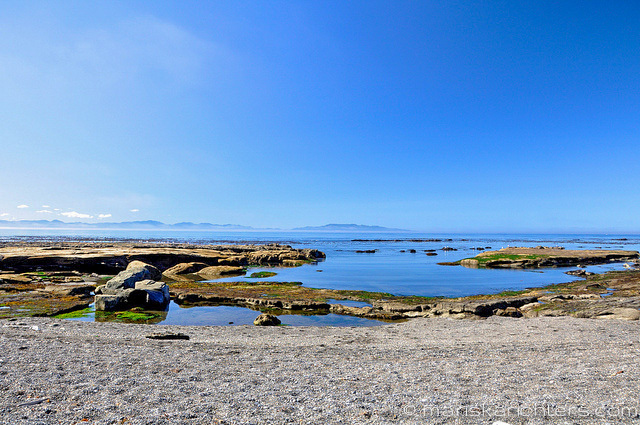 Botanical Beach is a true gem on Vancouver Island’s west coast. It’s a must see and is one of my all time favourite day trips. For more information, please visit the BC Parks website. What have you discovered in the tide pools at Botanical Beach? Sandcut Beach is one of my favourite day trips along Vancouver Island’s southern west coast. It is situated between French Beach Provincial Park and Jordan River, about 30 kilometres west of Sooke along the Juan de Fuca Highway. Access to the beach is easy to find with a gravel parking lot just off the highway. The beach is about a 10-minute walk from the parking lot along a trail through thick forest of giant cedar, spruce and douglas fir trees draped with moss and witch’s hair, also known as old man’s beard. You’ll walk along a boardwalk and take in fantastic views of the Olympic Peninsula through the breaks in the trees as you make your way to the beach. After a short walk along the stone and pebble beach, you’ll find a beautiful sandstone waterfall. It’s a perfect spot to plant your picnic basket and blanket to take a break for lunch. If you’re a rock collector, there are thousands upon thousands of rocks to explore and collect on the beach, and if you like beach creatures, some will have all kinds of life under them when overturned. On warmer days, it’s a beautiful place to swim and there are some nice sandy patches to make it easier to walk into the water. Cliffs line the beach and at the end there is a gorgeous rock formation that you can climb to get a bird’s eye 180 degree view of Juan de Fuca Straight and the Olympic Peninsula on a clear day. Sandcut beach is a great place for a campfire to roast a tasty lunch (please mind the fire restrictions), and if you’re lucky, you’ll even see a pod of whales playing out in the open water as you sit on the beach listening to the wind, waves and the pebbles tumbling in the surf. Sandcut Beach is one of the more natural beaches along Vancouver Island’s southwest coastline. There are no facilities provided, so make sure you come prepared. Do not leave valuables in your vehicle. Thieves are active in the area and are not shy to break into cars. Make sure you take your valuables with you and lock your car before heading to the beach. There are sometimes volunteers keeping an eye on the parking lots during high traffic times, but don’t count on this being the case on a regular basis. Respect the wildlife. There is all kinds of wildlife on Vancouver Island, including bears and cougars. Be aware of your surroundings and if you happen to come across local wildlife, do not feed it, do not approach it, and give it lots of room. Wildlife gets dangerous if they feel cornered or have young with them. Steer clear, even if it means you need to leave the beach for your own safety. Protect yourself from the sun. Use sunscreen and bring a hat. No one likes a sunburn and skin cancer is largely preventable. Be sun smart. Bring a camera! Sandcut Beach is a beautiful place for photography, especially the waterfall. We all have our camera phones with us these days, but it’s well worth it to bring your actual camera to this one. Have you been to Sandcut Beach? Please share your experience in the comments. French Beach Provincial Park is located on the west coast of southern Vancouver Island on the Straight of Juan de Fuca. It’s a great day trip or weekend camping getaway, and is only about an hour and fifteen minute drive from Victoria on Highway 14. Not only does the park boast a beautiful beach, but visitors can also enjoy the picnic area with barbecue pits, hiking trails, a playground for kids. Other park Facilities include 69 vehicle accessible campsites, located in the forest approximately a 5-10 minute walk from the beach, a sani-station, pit toilets and fresh water. Do not leave valuables in your vehicle. Thieves are active in the area and are not shy to break into cars while you are out enjoying the beach. Make sure you take your valuables with you and lock your car before heading to the beach. Respect the wildlife. There are all kinds of wild animals on Vancouver Island, including bears and cougars. Be aware of your surroundings and if you happen to come across local wildlife, do not feed or approach it, and give it lots of room. Pack it in, pack it out. If you bring a picnic to the beach, make sure you pack out all your garbage and dispose of it in the waste cans provided. No one likes a litterbug, please keep our beautiful parks clean. Be aware of the tide. Tide Tables are posted at trailheads. Remember to add one hour to the listed tidal times during May to October as Daylight Savings Time is in effect. The currents can be quite strong and kayaking and canoeing is not recommended here. Camping Reservations. This is a very popular campground, so I recommend you make a camping reservation to guarantee yourself a spot. The campground is 100% reservable so chances of getting a last minute, spontaneous campsite are slim. Reservations are available from May 15 to August 31. For more information about the French Beach Provincial Park, or to make your camping reservation, please visit the BC Parks website. Have you been to French Beach Provincial Park? Did you camp or take a day trip? Please share in the comments. Since moving back to Vancouver Island, I’ve done my best to follow through on my promise to myself to explore a new place or try something new at least once a week. 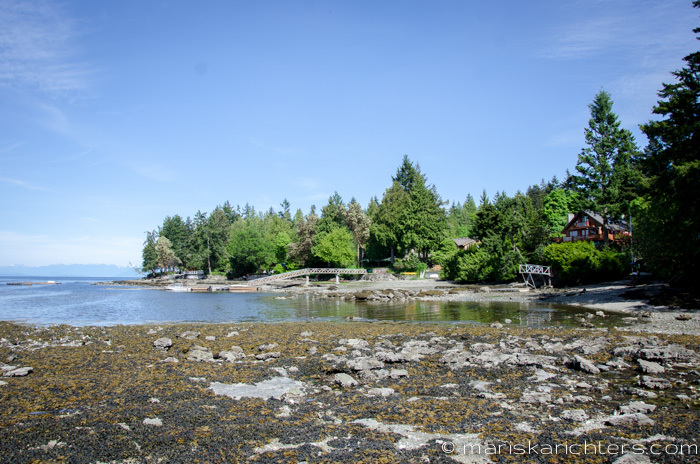 This week was no exception and when I unexpectedly ended up exploring Protection Island, just off Nanaimo, BC. To get to Protection Island, you need to take a 5-minute passenger ferry near the corner of Front Street and Promenade Drive. Although I found the ferry cost to be somewhat expensive ($9 return), it was well worth it once I saw what awaited me on the other side. The main mode of transportation on Protection Island is by golf cart. The dirt roads are lined with lovely rustic cabins and cottages, and the beachfront homes have absolutely beautiful views. I found the island to have a very welcoming atmosphere; the people were friendly, saying hello or waving as they passed by in their golf cart, or on their bicycle. 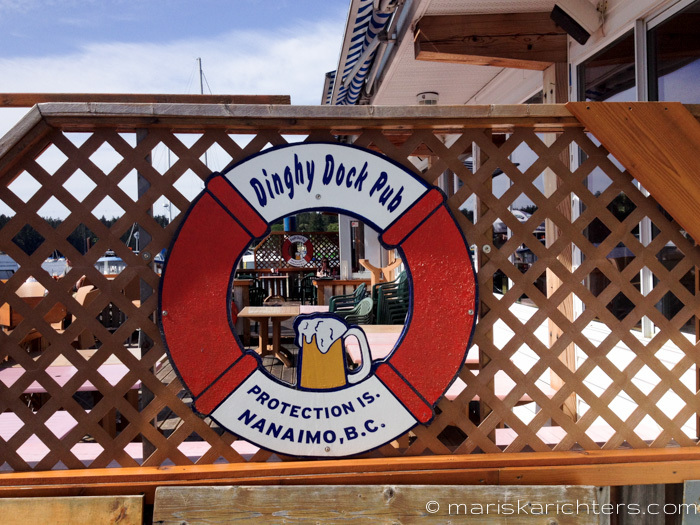 We arrived on the island at mid-afternoon and decided to walk around and explore a bit before finding a seat on the sunny patio at the Dinghy Dock Pub. We weaved down the dirt roads (all named with a pirate theme) and explored every beach access trail we came across. 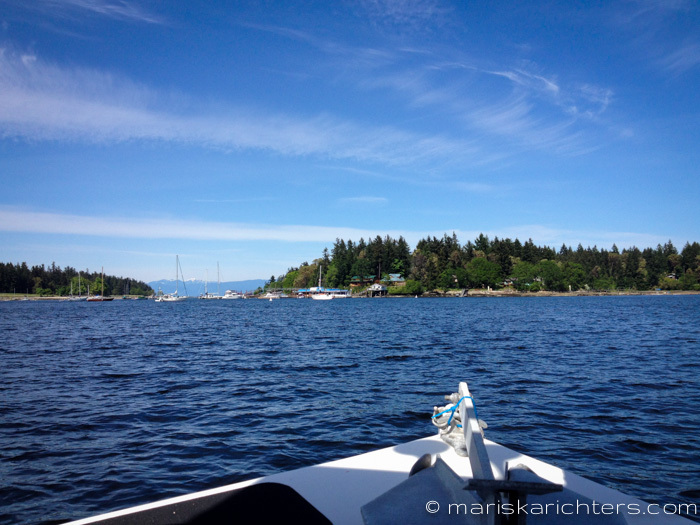 It was hard to believe that Nanaimo was only a 5 minute boat ride away. It felt like a whole other world and was a bit reminiscent of the time I spent on the islands in Belize. There were even palm trees! All that exploring makes a girl thirsty, so after a couple of hours we found our way back to the Dinghy Dock Pub and found a seat on the floating patio for well-deserved cocktails and appys. The pub was decorated with a pirate theme and also had a huge projection tv, perfect for a fun hockey (or other preferred sport) night out. If you arrive by private boat, there are lots of boatslips around the pub to moor your boat while you enjoy your meal. We ordered the Thai mussels, crab stuffed mushroom caps and a pint of prawns. Sadly, I didn’t take photos of the food. I’m a huge fan of seafood, so as soon as the food hit the table I dived right in. The appys were delicious, the drinks were refreshing, the service was good and the hot sun and the view were amazing! Protection Island made for a perfect mix of afternoon exploration and patio time; I highly recommend it as a fun day trip adventure if you’re in the Nanaimo area. Although we didn’t stick around for sunset, I imagine this would be a perfect spot to watch it from. I look forward to returning later this summer to take one in and to explore the island further! The ferry runs from 7am to 10pm (11pm on Thursdays and Fridays). It leaves Protection Island every hour on the hour, and leaves the Nanaimo side 10 minutes past every hour. The ramp to access the Protection Island Ferry waiting room is located on the corner of Front Street and Promenade Drive in downtown Nanaimo. Have you been to Protection Island? Share your experience in the comments below.